I recently started having problems with my system, probably the result of a registry cleaner, and unfortunately I last backed up about a month ago and have installed software and added emails, etc., since then. All my connections have disappeared, and I can't connect with the Internet on my PC; am using an old laptop now. Programs start, but take forever to load, so long I thought at first the machine was crashing. The NXT3 backup program opening screen says something about the ability to backup applications & files without the system, which it says can be used for migration. I would LIKE to be able to (1) create an inclusive backup of my applications and files, without my system, (2) delete or reformat my system partition, (3) reinstall my Windows 7 Home Deluxe from scratch, and (4) restore the programs and files backup mentioned in (1), and (4) have my current software & emails and a "clean" O/S so my machine works again. Unfortunately, I can't find DIRECTIONS as to how to do this, if in fact the software CAN do it. I would greatly appreciate help/advice. Thanks! Then restore our Data and suffer through all the tinkering that a "new PC" needs. The same version of BackOnTrack [boT] is in both versions of NXT 3. However Restore has been deliberately castrated so that it can't restore Partitions, HDDs, or Whole Computers from the backups it makes. We wondered at the time why they bothered keeping BackOnTrack in the Creator NXT suite. The 'Introducing Roxio BackOnTrack' page mentions "to easily migrate user files" not to migrate programs, but this is all a bit moot in any event. You're not wanting to backup one machine and restore it to another, and BoT can't do it. You want to: (1)-remove and store all installed applications and settings; (2)-clean reinstall Windows; (3)-replace all apps and settings. I'm pretty sure there's no backup software anywhere which will allow you to do that, because each program you install actually modifies your Windows system by adding/changing files, folders, or registry entries and there's no simple way of extracting and storing all those modifications. 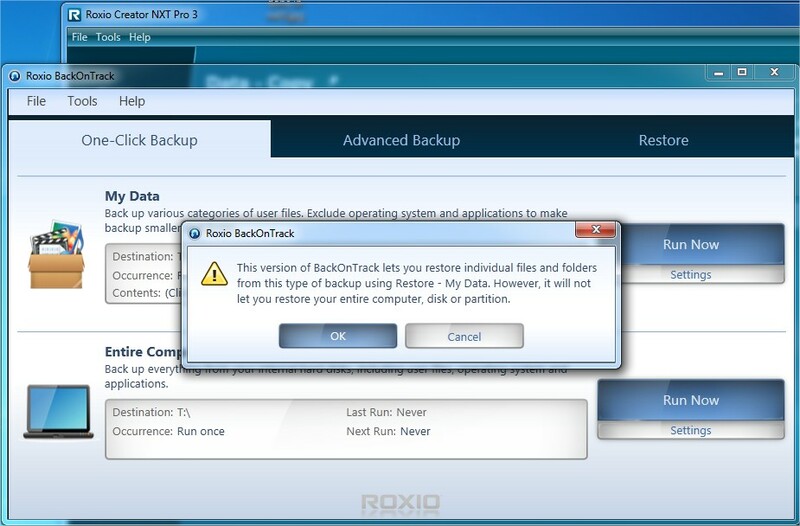 (1) Get backup software which will allow a full system backup and restore (not BackOnTrack) and do a full backup, checking that you have the ability to do a full restore before you do anything else. Jim Hardin, I was hoping I could save the programs on the computer with problems (Win 7 HP), reinstall the O/S, and then restore the programs, NOT port over the s/w from the older XP Pro laptop. Brendan, Is the Back on Track version in NXT4 any better, just for future reference? I DO have a backup, it's just a month or so old and I made some program changes since then. Would rather not take the laborious process of finding out what I've changed since then and reinstalling it all, and am not sure how to backup and restore my email since then. I popped an Open SuSe Linux CD in and IT had no trouble accessing the Internet, so I know the problem's Windoze, not hardware. I DO have the main competitor's software, and that's my backup. Last time I tried restoring a backup it didn't remove the pc files before copying the backup mixed in with them. Bummer. I guess I need to format the partition first before a restore? Anyway, thanks for the suggestion. I will examine (as best I can -- it is WAY slow now -- the desktop to determine what programs I installed after the backup, try to find out from the manufacturer how to save email & other settings, then try the upgrade in place windoze suggestion. If that doesn't work, I will reformat the HD and try unpacking the backup there using my rescue cd. Unless you have further advice on this issue. No, NXT 4 has the same pitiful version as NXT 3. The main change in NXT 4 is that they've now castrated MyDVD as well. Backup software will usually let you backup selected visible files/folders, or backup a whole partition/HD. Restoring a file backup can be done while you're running in your Windows and adds the files to those that are already there. Restoring a partition generally wipes the destination first. Backing up/restoring your Windows system drive/partition requires you to be booted from a CD or another system because running files are locked and inaccessible. If your last restore added files to the HD, it sounds like you have a file backup rather than a system one. I don't think it will have the necessary files and structures to restore to a bootable system. I would make a bootable system backup of your ailing system, and then if something goes wrong during repairs you can always get back to where you are now without losing everything. As a footnote, Brendan's suggestion of using the "upgrade" option on the Windows DVD worked! Thanks again. Doing the "In place upgrade" ? Excellent!